The troll is a mythical creature of Scandinavian origin that has become a popular staple in the realms of legend, folklore, and fantasy. One of the most anthropomorphic fantasy creatures, trolls have been depicted in vastly different ways. From their Scandinavian fairy tale roots, in such tales as Three Billy Goats Gruff, trolls have achieved international recognition, and in modern fantasy literature and role-playing games, trolls are featured to the extent of being stock characters. Generally considered somewhat dangerous, whether through their larger than human size and strength or through more magical means, trolls are recognizably similar to human beings. A school of thought has it that the mythical trolls originated in knowledge, if not memories, of Neanderthal humans. Whatever their origin, trolls represent that which is somewhat peculiar and different, yet hauntingly similar to ourselves. Efforts to depict trolls in literature, art, music, and other cultural forms, may reflect our desire to embrace, yet at the same time fearing, those who are different. Throughout the ages, the differing renditions of trolls has fallen into two distinct categories. The first is that of the forest or mountain troll, a large, brutish, and dumb creature that resembles a disproportionately giant human. Often these creatures have exaggerated facial structures, such as jutting lower jaws and protruding brows, similar to the stereotypical image of a Neanderthal. The other type of troll is said to live underground, or in deep caves and caverns. They are smaller, sometimes smaller than humans, and often have disproportionately smaller features, such as short stubby arms and legs, although they tend to have a fatter abdomen. Trolls of this type are often uglier and depicted as gross-looking, slimy being a favorite adjective as a common reaction to things that dwell in underground and dark places. The meaning of the word "troll" is uncertain. It might have had the originally meaning of "supernatural" or "magical" with an overlay of "malignant" and "perilous." Another likely suggestion is that it means "someone who behaves violently." 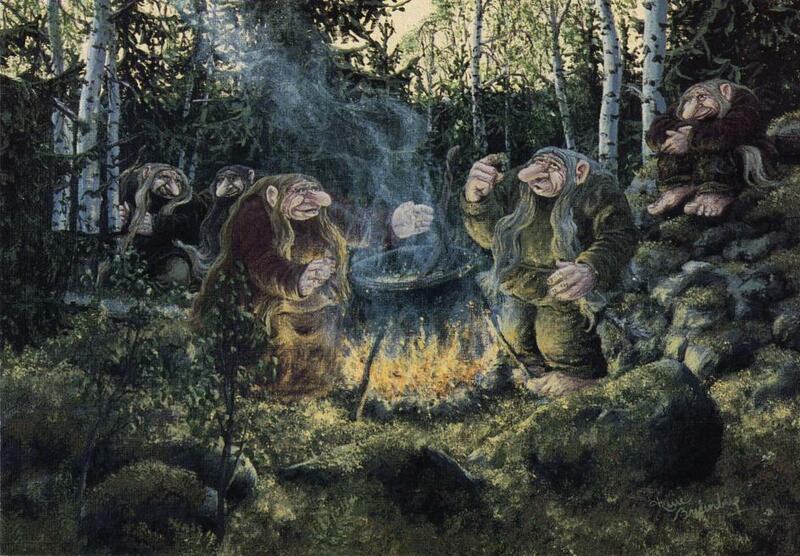 In old Swedish law, trolleri was a particular kind of magic intended to do harm. It should be noted that North Germanic terms such as trolldom (witchcraft) and trolla/trylle (perform magic tricks) in modern Scandinavian languages do not imply any connection with the mythical beings. 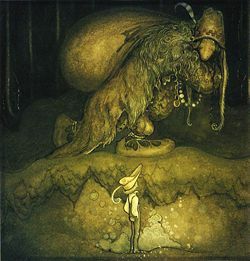 Moreover, in the sources for Norse mythology, "troll" can signify any uncanny being, including but not restricted to the Norse giants (jötnar). The ambiguous original sense of the word "troll" appears to have lived on for some time after the Old Norse literature was documented. This can be seen in terms such as sjötrollet (the sea troll) as a synonym for havsmannen (the sea man)—a protective spirit of the sea and a sort of male counterpart to the female sjörå. Some scientists, such as Spanish paleoanthropologist Juan Luis Arsuaga, have theorized based on fossil evidence that Neanderthals and Cro-Magnons occupied the same area of Europe at the same time. The distinguished Swedish-speaking Finnish paleontologist Björn Kurtén has entertained and expanded this theory to determine that trolls are a distant memory of an encounter with Neanderthals by our Cro-Magnon ancestors some 40,000 years ago during their migration into northern Europe. The problem with this theory is that neither Neanderthals nor Cro-Magnons existed in this part of Europe during the ice-age. Most of Scandinavia was covered by a large glacier and the area was not occupied until much later. Another explanation for the troll myth is that the trolls represent the remains of the forefather-cult which was ubiquitous in Scandinavia until the introduction of Christianity in the tenth and eleventh centuries. In this cult the forefathers were worshiped in sacred groves, by altars, or by grave mounds. One of the customs associated with this practice was to sit on top of a grave mound at night, possibly in order to make contact with the deceased. With the introduction of Christianity however, the religious elite sought to demonize the pagan cult, and denounced the forefathers as evil. For instance, according to Magnus Håkonsen's laws from 1276, it is illegal to attempt to wake the "mound-dwellers." It is in these laws that the word "troll" appeared for the first time, denoting something heathen and generally unfavorable. This fits with the trolls in Norse sagas who are often the restless dead, to be wrestled with or otherwise laid to rest. It is possible that both of these theories hold validity. Since there have been assertions that legends of dragons were based on ancient cultures discovering dinosaur bones, then it is possible that early man had some knowledge of Neanderthals and incorporated them into myth. The physiology of trolls, outside of the exaggerated size, does correlate to how Neanderthals probably looked. However, the forefathers’ theory holds just as much validity, and as with determining any beliefs of ancient cultures, there may be more than one source. The second tradition is most prominent in southern Scandinavia. They are usually small, mysterious creatures that live in dark dwellings and are mischievous. Often than not, the trolls kept themselves invisible, and then they could travel on the winds, such as the wind-troll Ysätters-Kajsa, or sneak into human homes. Whereas the large, ogre-like trolls often appear as a solitary being, the "small" trolls were thought to be social beings who lived together, much like humans except out in the forest. They kept animals, cooked and baked, were excellent at crafts, and held great feasts. 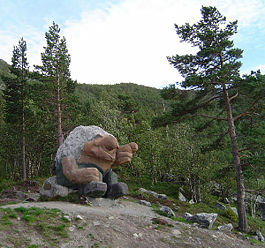 Like many other species in Scandinavian folklore, these trolls were said to reside in underground complexes, accessible from underneath large boulders in the forests or in the mountains. These boulders could be raised upon pillars of gold. In their living quarters, they hoarded gold and treasures. Opinion varied as to whether or not the trolls were thoroughly bad, but often they treated people as they were treated. Trolls could cause great harm if vindictive or playful, though, and regardless of other things they were always heathen. Trolls were also great thieves, and liked to steal from the food that the farmers had stored. They could enter the homes invisibly during feasts and eat from the plates so that there was not enough food, or spoil the making of beer and bread so that it failed or did not become plentiful enough. Both eat and drink with him. Like other Scandinavian folklore creatures they also feared steel. According to the stories, they were hunted by Thor, who threw Mjolnir, his hammer, causing lightning bolts to kill them. Though Mjolnir was supposed to return to Thor after being thrown, these hammers could later be found in the earth (actually Stone Age axes) and were used as protective talismans. Legends from the Middle Ages feature trolls of horrifying and even satanic proportions: church bells, crucifixes, and even the name of Christ spoken aloud scared them These tales drew a connection between demons, fearsome creatures who had fallen from heaven and lived in the subterranean hell, and trolls, who dwelled in the dark underground. 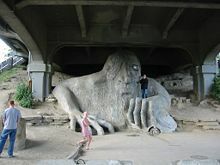 In Spenser's The Faerie Queen, King Arthur, the symbol of a Christian knight, defeats a giant troll, representing evil. 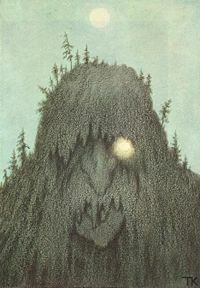 Edvard Grieg, the Norwegian composer of the later nineteenth century, wrote several pieces on trolls, including a score based on Henrik Ibsen's Peer Gynt, with the famous In the Hall of the Mountain King, and March Of The Trolls. Regarding his motivations, Grieg wrote: "The peculiar in life was what made me wild and mad ... dwarf power and untamed wildness...audacious and bizarre fantasy." Grieg's former home, Troldhaugen ("The Troll's Hill"), is now a museum. 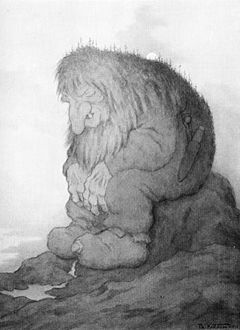 Trolls became exceedingly popular in the late nineteenth to early twentieth century when neo-romanticism in Europe celebrated regional folklore and legend. 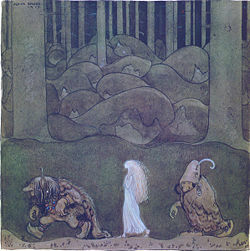 These tales and illustrations by artists like John Bauer and Theodor Kittelsen, came to form the ideas most people have of trolls today. Asbjørnsen and Moe's collection originally published in 1879 features a number of traditional fairy tales where trolls hold princesses captive, such as The Three Princesses of Whiteland, Soria Moria Castle, and Dapplegrim, and two where trolls invade homes on Christmas Eve to make merry, Tatterhood and The Cat on the Dovrefell. 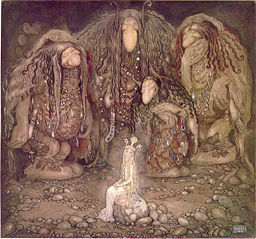 Female trolls may conspire to force the prince to marry their daughters, as in the story East of the Sun and West of the Moon, or practice witchcraft, as in The Witch in the Stone Boat, where a troll usurps a queen's place, or in The Twelve Wild Ducks, where she turns twelve princes into wild ducks. In other tales, the hero matches wits with the troll: Boots and the Troll, and Boots Who Ate a Match With the Troll. Scandinavian folk-tales involving trolls such as "Three Billy Goats Gruff," are familiar to other European and European-derived cultures. In the U.S. and Canada, the old belief in trolls is paralleled by a modern belief in Sasquatch or "Bigfoot." Trolls have become a staple in fantasy literature, most notably by British author J. R. R. Tolkien, who used trolls in both The Hobbit and The Lord of The Rings trilogy, and J. K. Rowling, the author of the Harry Potter series. Pop forms of fantasy, such as comic and role playing games (such as Dungeons and Dragons) commonly employ trolls as stock characters. ↑ "The Neanderthal's Necklace." Four Walls Eight Windows. 2002. ↑ Alba, Stockholm. 1978. "Dance of The Tiger: An Ice Age Story" ("Den Svarta Tigern"). ↑ Innamorato Williams, Bobbi Jo. "Mythical Creatures Pages." Pagewise.com. Retrieved March 5, 2007. ↑ Herresthal, Harald. 2001. Edvard Grieg — Biography of Norway's Greatest Composer. Great Norwegians. Metropolitan News Company. Retrieved March 8, 2007. Schön, Ebbe. 1998. Svensk folktro A-Ö. Schön, Ebbe. 2001. Folktro från förr. Gourmander, painting by Hasse Bredenberg. This page was last modified on 18 December 2015, at 17:17.